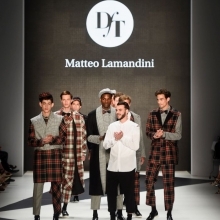 Matteo Lamandini has won the “Designer for Tomorrow” fashion talent award, presented by Peek & Cloppenburg Düsseldorf and its online shop Fashion ID. The Italian designer was selected by the Jury Board – led by American designer and award Patron Tommy Hilfiger – after he presented his “Zoot Suit” collection on the catwalk of Mercedes-Benz Fashion Week Berlin. Before the announcement was made, the DfT winner of 2013, Ioana Ciolacu, presented her winning collection “Hunters.” Over 700 guests attended, including the mayor of Berlin Klaus Wowereit, Eva Padberg, Luca Gadjus, Barbara Becker, Alina Süggeler, and Lisa Tomaschewsky. Lamandini gives a modern twist to traditional items from the male wardrobe, such as narrow tailored coats, suits, and shirts printed with different check patterns. “We are excited about working together with Matteo and are pleased to support him as he takes his first steps in the fashion industry. In the coming twelve months, Matteo Lamandini can expect a sustainable, individual sponsorship program. 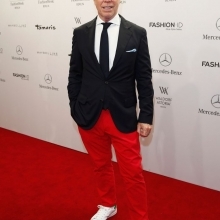 Our Patron Tommy Hilfiger will be an incredible mentor to him during his placements with Tommy Hilfiger design teams in Amsterdam and New York, and as he develops his signature Capsule Collection for our customers next year,” says John Cloppenburg, Member of the Executive Committee and DfT Jury Board member. Ioana Ciolacu, DfT winner in 2013, says of the award program: “I gained many new insights thanks to the DfT award, both as a designer and as the owner of my own label.” The culmination of the year-long sponsorship program took place last night as Ioana presented her new collection “Hunters” at her first own fashion show. This consists of 25 outfits inspired by the relationship between hunter and prey. Ioana emphasizes the playful mood of the collection with a combination of pale tones, bold statement colors, and luxurious digital prints that she designed herself. Christiane Arp (Editor-in-Chief VOGUE), John Cloppenburg (Member of the Executive Committee Peek & Cloppenburg KG, Düsseldorf and Fashion ID GmbH & Co. KG), Melissa Drier (German Correspondent Women‟s Wear Daily), Bay Garnett (Stylist, Author), Karen Heumann (Founder and Chairwoman (Spokesperson) thjnk), Marcus Luft (Fashion Director, Member of Chief Editorship Gala), Annette Weber (Editor-in-Chief InStyle), Michael Werner (Editor-in-Chief TextilWirtschaft). The “Designer for Tomorrow” fashion talent award has been presented as part of Mercedes-Benz Fashion Week Berlin since 2009. As an initiative of Peek & Cloppenburg Düsseldorf and its online shop Fashion ID, the award provides a visible platform for creativity. It offers top up-and-coming fashion talent the opportunity to be discovered as such and to receive a great deal of attention from the fashion industry and the public. This year‟s finalists were Matteo Lamandini from Italy, Maria Lola Roche from Ireland, Sylvia Roustcheva from Bulgaria, Yong Kyun Shin from South Korea, and Julia Winkler from Switzerland.